Uses industry standard tools to optimize any JPEG, PNG and Gifs - including animated Gifs. It can do both lossy and lossless optimization. Adds a right-click menu to any folder and image in Solution Explorer that let's you automatically optimize all PNG, GIF and JPEG files in that folder. Simply right-click any file or folder containing images and click one of the image optimization buttons. You can also right-click a folder to optimize all images inside it. If you chose best quality optimization, the tool will do its optimizations without changing the quality of the image. If you decide to sacrifice just a small amount of image quality (which in most cases is unnoticeable to the human eye), you will be able to save up to 90% of the initial file weight. Lossy optimization will give you outstanding results with just a fraction of image quality loss. 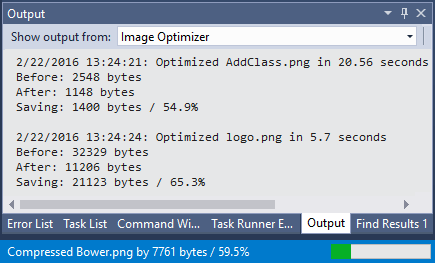 The Output Window shows the detailed output from the optimization process and progress is displayed in the status bar. Optimizing an image can easily take several seconds which feels slow. This extension parallelizes the workload on each CPU core available on the machine. This speeds up the optimization significantly.